Today we break away from the parenthetical referencing styles that we have covered over the last few blog posts (MLA, APA, Harvard and CMOS author-date styles) and introduce a numbered referencing system from the Chicago Manual of Style (CMOS). 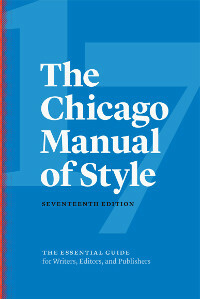 The Chicago Manual of Style (CMOS) was last updated in 2017 with its seventeenth edition. 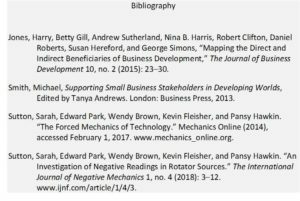 It details two ways to reference sources in documents: the first uses the parenthetical author-date referencing style and the second uses notes and a bibliography. We focused on the author-date style in the last blog. Today we are going to focus on the CMOS notes and bibliography style of referencing, which is commonly used in the fields of history, literature and the arts. The CMOS note referencing style breaks away from parenthetical referencing and the reference numbers refer to the numbered footnote (or sometimes endnotes) within which the full reference can be found. The in-text reference number is usually superscripted and placed after the punctuation (except for a dash); however, it could also be full sized and place before the punctuation. 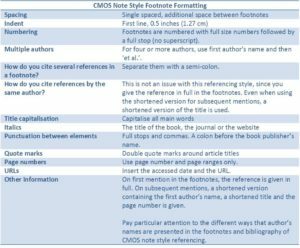 CMOS notes style references usually uses footnotes, which are located at the bottom of the page in which the reference is cited. When a source is first cited, it is written out in full. On subsequent mentions, a shortened version of the reference is given. Up to four authors are listed and if there are more then ‘et al.’ is used after the name of the first author. 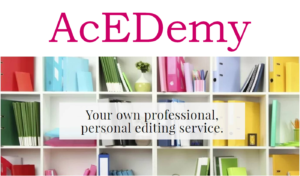 As with all referencing styles, references are formatted slightly differently according to the type of source they are, so attention to detail and consistency is required. 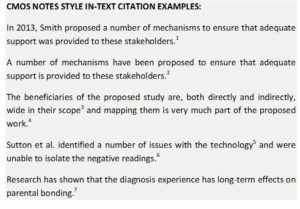 As with all referencing styles, references are formatted slightly differently according to the type of source they are, so attention to detail and consistency is required. 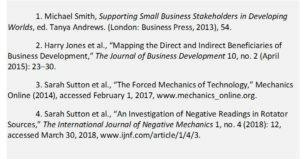 It is important to note that in the CMOS note and bibliography style, the references are not presented in the same way in the notes as they are in the bibliography, so you will need to spend some time ensuring that their presentation has been updated accordingly in each. In the next AcEDemy blog post on referencing, we will be looking at the Vancouver referencing style.